I bought the xCountry back in June 2014 and initially listed the modifications I felt necessary to turn the bike into something that I’d want to take on an adventure (read crossing countries/continents on a mixture of surfaces). Since then I’ve used the bike to tour through Spain and tackled old Dakar pistes in Morocco. That’s an additional 4,000 miles to figure out what works and what doesn’t. Neoprene gaiters are a favourite amongst off-road enthusiast and adventure travellers wanting to protect their fork seals from the type of dust dirt and debris they’ll encounter on the trail. Personally I’m not a huge fan of full length gaiters from an aesthetics point of view, but recognise their value when it comes to protection. These Kriega fork seal covers offer all the protection I need and still look good. What’s more, they can added or removed in less than 30 seconds. There are at least three/four reports across ADVRider, HUBB, and UKGSER, of cracks and breakages of the rear subframe. Incidentally all are on the xChallenge and not the xCountry, but since the bikes both share the same frame this was one area that concerned me. Travelling alone I probably wouldn’t bother. I’d pack less and not have any weight further back than the pillion seat. Travelling two-up however, means space is at a premium and the rear rack will be fully utilised. As such, I found a local engineering workshop to beef the frame up a little. Most importantly, I doubled the thickness of the aluminium wall up top where most of the stress forces are applied. I also added some support to the lower area too. It was evident in Morocco that the rear shock was not up to the task. It bottomed out multiple times forcing me to slow right down on the whoops. I could have just replaced it with a Hyperpro or Wilburs system, but I need adjustable preload. Both the aforementioned shocks offer that, but with the piggy-back reservoir, they won’t fit on the bike and allow space for the pillion. It’s claimed that the original Sachs shock is a decent unit just a bit under-sprung from the factory. So I had mine refurbished and resprung by Firefox Racing in Yorkshire. I haven’t put it through its paces yet off road, but on the road it seemed fine enough. Though the rebound seems very slow even when turned right up. I guess time will tell how well it works out. I will say this, although the person I spoke with about the shock was very knowledgeable, I wouldn’t send a shock there again. They are difficult to communicate with, I had to call multiple times regarding my shock and often they couldn’t answer questions at that time, and couldn’t even give me a price for the work even after taking my card details. Update Dec 2015: On the road in South America I’ve had multiple problems with the shock. Firstly, despite me specifying the weight I’d be carrying and the type of roads I’d be riding, to Firefox Racing, the shock was still woefully under-sprung. This was made worse by them placing the top collar too high up the shock, effectively rendering the preload useless. After I had a professional correct that the preload itself went in Bolivia and I had to have a spacer added. Even worse in Argentina, the new YSS heim joint they installed completely snapped in two, leaving me stranded on a gravel section of Ruta 40. As you can imagine I would not deal with them again, nor would I recommend them to anyone else, especially since my complaint to them was completely ignored. Best avoided. In part one of my modifications I mentioned changing the OEM rack for something a little more capable. Rather than design and cut my own, I came across a cheap Touratech rack from a BMW R1150GS. Using the same OEM rack mount, I drilled some new holes in the Touratech rack and offered up it up to the frame. The larger plate now means that my luggage is (ever-so-slightly) at less risk of being burned by the nuclear reactor of an exhaust. The only thing to watch out for is the three 3mm bolts that hold the plate to the frame. Such small bolts don’t fill me with confidence, but it’s held well so far. With a tank capacity of just 9.5l and economy that can easily drop as low as 50mpg, the xCountry desperately needs additional fuel capacity to turn it into an adventure bike. You can buy an xTank from Netherlands for around £500, or you can buy a 5l Acerbis tank for around £60. Being something of a penny pincher I opted for the latter. To mount that tank I cut a bracket out of 3mm aluminium and attached it with to two of the bolts holding the rack to the subframe, and one bolt to the subframe support. This kept the tank nice and tight to the bike which was important when carrying luggage. The right-hand side Dirtbagz pannier rail had to make way. In Morocco, I took a mad/crazy rocky route from M’hamid to Zagora. At some point along the route the tab holding the bracket to the subframe support failed, so at Garage Sahara Zagora I had a Mad Max style cage created. The cage is made from 2mm steel and uses the same mounting points as my initial bracket. It is rock solid, and should do me well on my trip to South America. All over the Internet bike forums are littered with posts from riders complaining about their poorly performing headlights. Previously owning the UK’s only dedicated motorcycle bulb store, I know a fair bit about headlights. 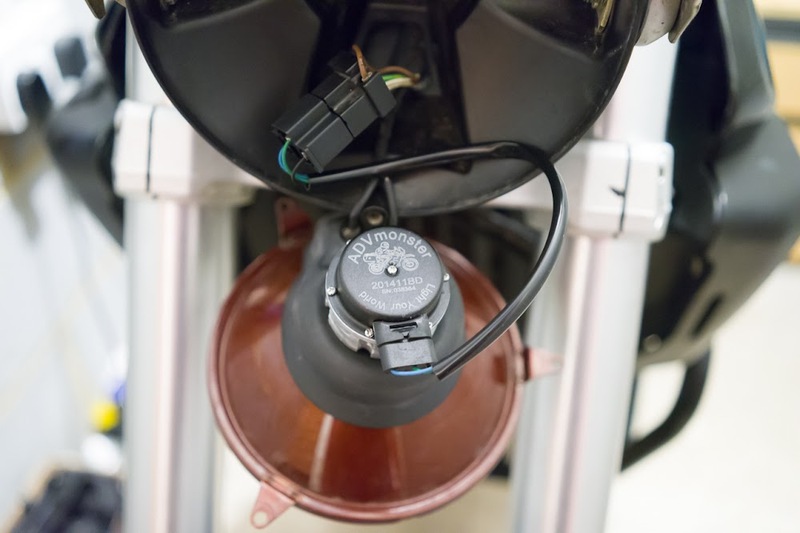 In most cases all that can be done is to change the OEM long life bulb for a higher performance part, and if you’re still keen then add a relay. The reason I’d stop there is that it’s the reflector that often the cause of poor headlights, and there isn’t much that can be done about that other than changing the whole unit. The best headlights I’ve come across are those on the 2007 VFR800 and the Aprilia Falco. Both are great, and certainly better than the xCountry’s wimpy 6″ unit. That being said, the light output of the X has never bothered me. What does bother me is the 55w draw from the 280w that the bike generates. As the girlfriend and I both have heated vest I desperately needed to claw back some wattage. The ADV Monster LED headlight was the simplest way to do that. The LED unit kicks out 2,300 lumens making is bright as the best halogen bulbs, but draws just half the power. The saving helps ease my concerns about draining the battery. Has the Led worked as you hoped in both light output and life? Was it a simple mod? Your G650 is fitted with a screen in your photos but I can’t see any mention of it, an you tell me what make/type it is please? Great blog btw, keep it up! Cheers, George. It was just a generic fly screen. I don’t remember the brand. I think it was from a Bandit 600 and I cut it to fit. Probably cost me £30 on eBay.